Sarah “Sally” RHODES was born in Blackpool, Lancashire in 19061,2. 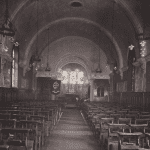 She went to the Lancaster Girls Grammar School 1917-19222. In 1923 her father remarried. His second wife Isabella Smythe had been a sister in Queen Alexandra’s Imperial Military Nursing Service (Reserve) in WW14. On September 1st, 1939, I found myself caught up in the whirl of activity which preceded the war. I spent the day evacuating children away from my ward in a London hospital, and packing everything away, so that it might be turned into a casualty clearing station for Westminster. I listened apprehensively to the hourly bulletins on the wireless, and to announcements of reserve group callings up. By tea-time my turn had come and by 10-30 p.m. I was in a strange house in Cookham, Hants., a member of His Majesty’s Army and a billetee. For two weeks I reported daily in a hut under pine trees, filled up forms, had injections against this and that, bought kit, and tried to make myself realise that I was going on active service. Everyone seemed happy and enthusiastic until the last sobering morning of departure. on September 15th I landed in Cherbourg with the staff of a twelve-hundred-bedded General Hospital, which we proceeded to open, in tents, outside Dieppe. I tried hard to remember the L.G.G.S. And my French lessons, and soon learned to shop quite easily. There were no hostilities – but how we worked! The troops were not trained, and many were ill. We worked in heavy rain, mud over our ankles, then in the snow and frost we were so cold that we contemplated keeping our clothes on all winter, like the Eskimos. Then came a delightful spring, and working in the open was a joy. We lived in empty houses, with primitive sanitation, and bathed in canvas baths with water boiled on a primos stove. There was plenty to buy in the shops and no restrictions, so life was quite gay in spots. Then came the awful news of the invasion of the Low Countries, and we prepared to receive casualties. Trains scheduled did not arrive; patients only trickled in; and everyone became harassed and dared not say what they thought. At five one morning I wakened to hear someone tapping at my window. I was asked to tell the others that we were to pack and report with hand baggage only at eight a.m. for breakfast, ready to leave in convoy at eight-thirty. Our heavy luggage would follow. We never saw it again! For two days we travelled as a convoy of forty ambulances. We had no food until the second day. I shall never forget the roads blocked with refugees, the night we spent in Le Mans, when we began to realise fully how bad things were. At last we landed in England, two hundred of us, not daring to tell of the panic and chaos in case we were called defeatest; but we felt we had deserted the men when need was greatest and that the end could not be far. For the next year I worked in England. I saw the Battle of Britain and experienced the Blitz of London. 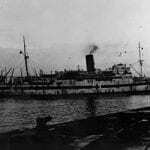 Then I joined a little hospital ship, the Dindra on the West coast of Scotland, in the most “secret” area I’ve ever been in, and transferred my interest to the Battle of the Atlantic. The scenery was magnificent and it cheered me to see tanker after tanker round the corner into the Loch, often as many as thirty. But gradually the casualties and the survivors decreased in number and orders came for me to take part in the repatriation of P.O.W.’s from Newhaven to Dieppe. We loaded ninety-seven Germans, but after three days negotiations broke down and we went to Scapa Flow, very bleak and cold in January, and I was glad to be posted to Tidworth where I was very busy with minor casualties to Paratroopers, who in those days were almost a myth to most people. Soon I was ordered to the Middle East with a hospital of six hundred beds. Another whirl of activity and more kit, white this time. I sailed in convoy with the 51st Highland Division and it was three months before we landed in Egypt. That voyage was an epic as well. We lost our convoy, the ship broke down twice, and the conditions were the worst I have ever known (and I have sailed in eleven different troopers). But everyone was wonderfully cheerful, and I think we all felt that this was going to be the turning point of the war, and we were proud to be with the men in the convoy who were to make history. We had a lovely time in Cape Town, Durban and Pietersmaritzburg where we stayed while the Banfora had repairs. The shops, the fruit, the lighted streets, and the welcome of the people delighted us. We were most disappointed when we found we were to go to Palestine, but we were mistaken. Palestine is the most interesting country I’ve been in, Jerusalem the most fascinating city, and it was easy to get about, and though we worked hard we had enough time to spare. We lived in tents in the south, and I thought it was all desert until in the spring the sand became a sheet of colour from tiny flowers, though there was no grass. News was good, and we were all happy; the Australian 9th Division came back after Alamain and that made me feel that we really had got to the turning point of the war. I was fortunate to to the Review by General Alexander before they left for home. In the spring the African campaign was over and we packed our hospital in very secret fashion in June, 1943. As we were only going to be allowed 100 llbs of luggage we began to guess where we were going, and discuss what we should take. We were already on our way when the Scilian invasion was announced. We had a peaceful voyage on a Mediterranean like a tub of dolly-blue. We landed in Syracuse in white frocks, hats and shoes, and both natives and troops greeted us wildly. My first impressions were of a delightful place with lovely oleander trees; but everything was thickly covered with dust and flies. The drainage and water systems were bombed; there was no A.R.P., and the civilians lived in caves in the hills. In a dreadful raid the first night, our transport was sunk. We began our hospital in a big lunatic assylum built in 1934, but infested with bugs. Lack of equipment, excessive numbers of malarial patients, lack of drainage, scarcity of water, and opressive heat made hard work very difficult. But we found Syracuse very interesting and Scicily lovely, dominated by snow-capped Etna. Promoted after that campaign, I went to Italy to join a field hospital stationed near Brindisi. I was impressed by the marble staircases of the building we used until I realised that it was just as bug-ridden as the one in Syracuse. In April 1944, I moved again, back to England to help open the Second Front. We were delighted to be in England in the spring – no country is so green. We re-equiped and crossed to Normandy on D.10, landing on the beaches in ducks. I was very optimistic and thought that this was the end of the war; but I had forgotten Japan. For six months we worked – moving forward every few weeks – in the orchards of Normandy, a chateua garden further North, and in a hospital in Brussels. To the Belgians the war seemed over. They were hilarious and we packed to follow towards Arnhem. Although the news was bad Brussels did not seem to notice. After reaching Holland I was ordered home for service in the Far East. I was amazed and felt I was badly treated. Going out this time we were all depressed. I landed in Bombay in February 1945. Travel in India was dificult, and there was much dirt and discomfort; in the hospital in Comilla conditions were very far from ideal; and we lived in little houses of bamboo basket-work which were infested with rats and mosquitoes. Life was complicated by the caste system, disturbed by thousands of crows and kites, and made unleasant by the lack of sanitation, though the natives were very clean in some ways. After a few weeks I was ordered to mobilize a Casualty Clearing Station “somewhere forward” and gussed it meant Rangoon. When we arrived in Calcutta we heard that the invasion had already begun and after two excessively hot days we embarked for Rangoon. V.E. Day came while we were on board ship but though we tried to celebrate it was unsuccessful, for we felt it had no connection with us. I was the first woman to land in Rangoon since the Japanese occupation. We found our C.C.S. already occpied by the Dufferin Hospital, and they were very glad to see us. The land here seemed very green and delightful after the arid parts of Asam and India, and the vegetation became lush after the Monsoon broke. Rangoon itself was in a sorry state, without drainage, lighting or water; it had been badly blitzed, and most of the population had taken shelter in the Shewdagon Pagoda, which was filthy, but where we were expected to take off our hoes to walk on the holy ground. When a General Hospital took over in Rangoon I flew over Burma to Meiktilla to take charge of yet another C.C.S., wondering if Singapore would be the next move. But it wasn’t. The news of the Atom Bombs shook the world and there was talk of peace. We went mad. For one week we had one long party, first for the patients, then for the Indian troops (in the open with Jeep headlights for illuminations), then one for ourselves, and last a party for everyone we knew. After that I went on leave in the hills where it was cool and peaceful. When I came back my release papers were waiting, and at last we arrived home in a hospital ship. We landed at Southampton, and after an official welcome for the troops we were dispersed to various release camps. It took me exactly half-an-hour to get through the process of becoming a civilian; but it took me months to get used to wearing civilian dress. Transcribed with permission from the Lancaster Girls Grammar School with grateful thanks (http://www.lggs.org.uk).